Language and culture are concepts increasingly found at the heart of developments in applied linguistics and related fields. Taken together, they can provide interesting and useful insights into the nature of language acquisition and expression. 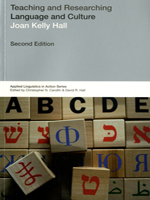 In this volume, Joan Kelly Hall gives a perspective on the nature of language and culture looking at how the use of language in real-world situations helps us understand how language is used to construct our social and cultural worlds.The conceptual maps on the nature of language, culture and learning provided in this text help orient readers to some current theoretical and practical activities taking place in applied linguistics. They also help them begin to chart their own explorations in the teaching and researching of language and culture. 6.2.5 Learning outcomes: Where are we going?